It is surprising what can influence our choice of television packages – but for many families catering for the tastes of young children is probably a factor. Despite honourable intentions to keep screen time to a minimum television is a big hit with little people. For those old enough to remember today’s offering for young children is far from the couple of hours Philip Schofield spent introducing the latest BBC shows from the broom cupboard – or the early morning Saturday takeover on ITV. Children’s TV is a non-stop 24-hour celebration of colourful characters and plentiful repeats. They can be so used to having what they want on demand that some youngsters struggle to grasp the concept of not being able to re-watch a programme straight away if you are tuned into terrestrial TV with no wifi back-up. More than just television shows, the characters in many of these TV programmes become heroes for youngsters with dressing up outfits, toys and even party themes being available. Not all shows are available on every provider though and, of course, access to some can come at a cost. The result is that parents need to decide which is the best value solution to meet the television demands of their child – and the rest of the family. Sky has long been a popular choice with Nickelodeon being a real trailblazer for quality kids television shows. Sky also offers the Disney Channel – another huge favourite with young children and parents alike. ‘Terrestrial’ television has had a significant success story in the shape of CBeebies, which has spawned a number of legendary shows, while CITV is another popular choice. CBeebies, CBBC and CITV make Freeview a good decision for families looking to keep costs – and excessive choice – under control while still providing plenty of quality viewing. The real change recently for children’s television is streaming services such as Netflix and Amazon Prime, which can provide unlimited access to watch a favourite show time after time. Both streaming providers have top children’s TV characters’ television series on offer such as Paw Patrol and Peppa Pig along with a wide choice of other family television. 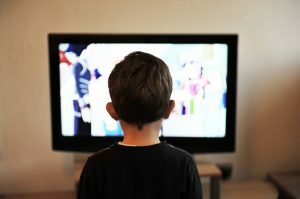 Supervision is perhaps an issue to consider when choosing children’s television and what youngsters will be able to access or click on by accident. While most providers have some form of safety concession nothing appears to be foolproof…and the all mediums need supervision. Contact Aerial Services about installing Sky or adding Freeview to you home to ensure your family has access to the programmes it wants.